Framed by flair tapered arms and tall wood legs, this chair is designed with a casual-contemporary style versatile for a variety of occasions and locations within your home. 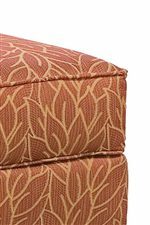 Soft and cozy, this item is upholstered with a plush box-faced seat cushion and padded back and arms for optimal comfort all around. Compact in form, this chair fits snugly in any corner of the room. 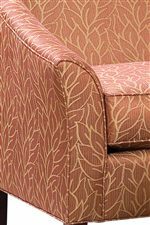 Whether quietly relaxing alone or energetically socializing with friends, this chair offers the ultimate lounge experience. 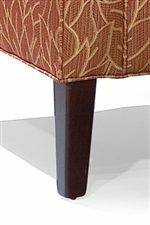 The 2710 Stationary Chair with Flair Tapered Arms by Fairfield at Olinde's Furniture in the Baton Rouge and Lafayette, Louisiana area. Product availability may vary. Contact us for the most current availability on this product.